A post and rail fence is usually a big part of the picture when one considers a traditional farm or horse ranch. It’s been that way for centuries; a wood board fence or oak fence has just always been thought of as a great way to keep horses securely contained in a given area. But have you thought about the potential problems with a wooden post and rail fence? We can help because we have done this research extensively, and know how different fencing materials compare. Don’t invest in a post and rail fence without talking to us - we have information you need. Call 877-306-4024. When planning the purchase of a post and rail fence (also called a Kentucky fence because of where they originated), there are several key factors that come into consideration. Every one of these areas is important in terms of the safety and security of your horses, and the returned value on your investment. Let’s look at each factor individually and see how this type of fence stacks up. Strength – A horse can kick a wood rail out of a post and rail fence, or compromise the security of the fence by just running into it. Maintenance – Requires continuous painting and treating to avoid moisture, which leads to rotting. It will still rot eventually anyway, which means having to replace posts and rails throughout its useable lifetime. Wood is also subject to insect damage. In addition, horses love to chew on wood (this is called "cribbing"), which causes a wood fence to fail prematurely. Containment effectiveness – When a horse knows it can knock down a rail or a section of fence, the fence is no longer effective. It doesn’t work for the horse to think breaching the fence is just difficult – it has to believe it’s impossible. That’s just not the case with a wood post and rail fence. Danger to horse – Like vinyl, wood rails splinter into shards when broken. This puts the horse at risk of impalement. Cost/value – A post and rail fence initially is less expensive to install, because wood is cheap. However, when you look at the purchase cost spread out over the life of the fence, it is not as great a value as it might appear. Appearance – Looks great in the beginning, but it doesn’t take long for moisture to set in and cause the paint to chip and the boards to warp. Repainting is continuous. Accumulated moisture over time will cause noticeable sagging of the rails, and the appearance is pretty bad by the time you need to replace the fence. Expected life span – You can expect a wooden post and rail fence to last about 10 years (rails) and 15 years (posts). 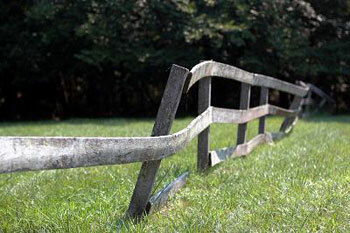 We have a better option than a traditional post and rail fence, and you will love it. Call us at 877-306-4024 for all the details and pricing. We encourage you to consider another option, which is preferred by many horse owners for a variety of reasons: our Steel Board Fence. Why is it so much better? It has the strength to not break when a horse runs into it or kicks it. It’s not affected by thermal changes so the rails don’t fall out. And no nails are used at all. There are no broken pieces forming dangerous shards that can impale the horse. Initial cost is higher, but overall cost is lower when spread out over the life of the fence. The same beautiful appearance is there for decades. We would love to talk with you about our fences, and how they can work for you. Contact us today!